← Combat Gears prediction hits bulls eye YET AGAIN!! 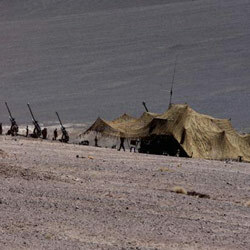 Showing no signs of withdrawing from the Indian territory after their incursion in Ladakh two weeks ago, Chinese troops have erected an additional tent in the Daulat Beg Oldi(DBO) sector raising to five the number of such structures in the area. The Chinese troops have also deployed Molosser dogs to keep a vigil, according to latest reports today from the site of incursion, 70 km south of Burtse in Ladakh division. The reports said the Chinese side have increased the number of tents to five. A banner hoisted outside the camp reads in English “you are in Chinese side” with the People’s Liberation Army(PLA) personnel maintaining a round-the-clock vigil along with the Molosser dogs which are considered as the best for keeping a watch in these high-altitude areas, official sources said. The report said aggressive patrolling by Indo-Tibetan Border Police (ITBP) had managed to push back intruding Chinese troops back by at least nine km before they settled down at the present location which is nearly 18 km inside Indian territory in the DBO Sector. The sector is at an altitude of 17,000 feet. According to a report submitted to the Ministry of Home and Defence, the incursion was detected by the ITBP on the intervening night of April 15 and 16 which sent its Quick Reaction Team which not only prevented the Chinese PLA personnel from further progressing in the area but also pushed them back across the Rakhi Nallah. The Chinese, however, halted their retreat and pitched their ‘artic’ tents well 18 km inside the Indian territory. The ITBP jawans immediately erected flags with message in Mandarin and English reminding the Chinese troops of “peace and tranquillity agreement and asking them to return to their side”. The face-off between the two sides has since continued even as ITBP jawans are assisted by Ladakh Scouts, an infantry regiment of the Army. Posted on April 30, 2013, in Army, Geo-Politics. Bookmark the permalink. Leave a comment.